This special edition was designed with a completely new colour combination: Extraordinary, pearl-like ribbons of colour in the brown, acrylic material reveal fine nuances of light and shadow. This aesthetically pleasing juxtaposition symbolizes a typical characteristic of Renaissance painting, making it an homage to the masterpieces painted by the period’s greatest artists. The rings and clip are elegantly decorated with 24-carat gold. The two-tone, 18-carat gold nib is optionally available in nib sizes F, M and B. A ballpoint pen to match this beautiful fountain pen is also featured in our range. These Souverän pens come in a practical folding box. If so desired, you can order prestigious gift boxes separately. 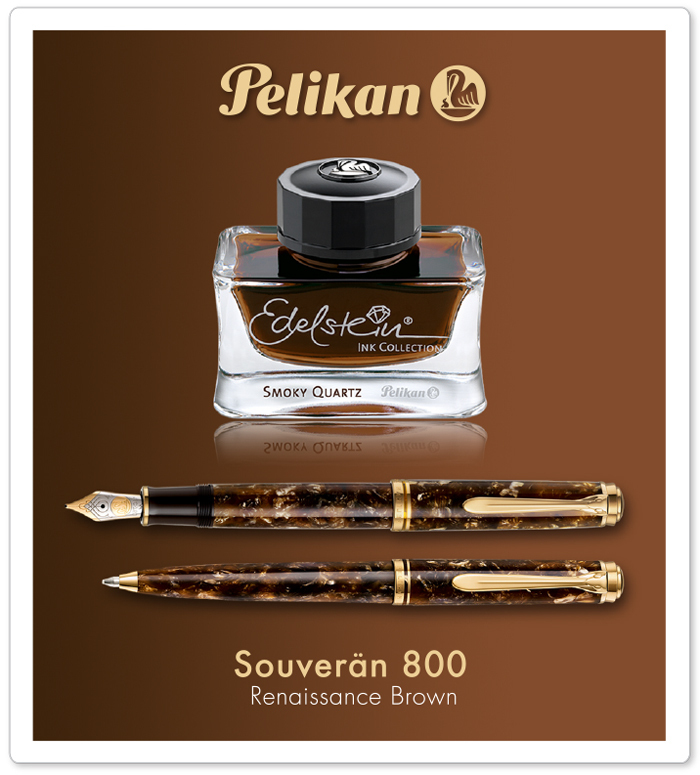 We also recommend our Edelstein Ink of the Year 2017 in Smoky Quartz, a matching colour.